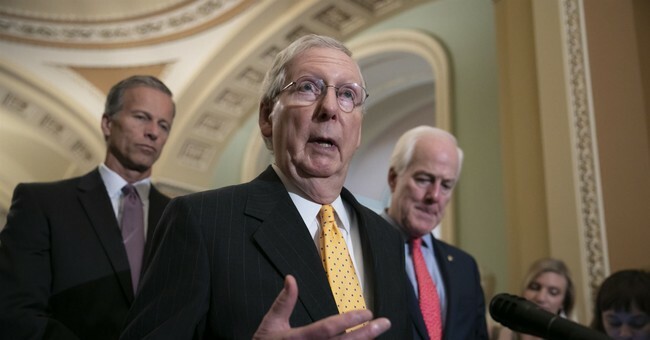 Sen. Mitch McConnell (R-KY) is "screwing" over his Democratic colleagues by keeping them in session this October and therefore keeping them off the campaign trail, according to Politico's Burgess Everett. "Majority Leader Mitch McConnell is planning to keep the chamber in session for a significant portion of October if not four entire weeks, costing Democrats key campaign trail days and allowing the Senate to continue its work into the fall, according to five Republican officials," Everett writes. Yet, Republicans say two weeks is plenty of time for their Democratic colleagues to make their case to voters. McConnell compared the Senate races to a “knife fight in an alley” on Tuesday, so clearly the elections are on his mind. But, judging by his remarks last week, his hardline stance on Senate work also has to do with judicial appointments. "We’re going to clear the deck of all the circuit judges,” an eager McConnell told radio host Hugh Hewitt. Twenty-four appellate court judges had already been confirmed by July, a record for the end of a president's second year in office. Two more were added to that list last month. Everett also ties the judicial confirmation to the midterms, noting that "If Democrats can pull off an upset win and take back the Senate, they can move to slow Trump’s nominations." Most significantly, Supreme Court nominee Brett Kavanaugh is waiting in the wings after his four days of confirmation hearings. Democrats have tried to disqualify him on a number of fronts, some suggesting he would not act as a check on the president or that he would overturn Roe v. Wade. On Wednesday, former presidential nominee Hillary Clinton claimed Kavanaugh referred to birth control as "abortion-inducing drugs." Even Washington Post editors put the kibosh on that. Despite the distractions, Republican leadership is prepared to take a vote by October.